So how do you plan on celebrating the most romantic day of the year with your other half this year? If he or she is the type who routinely forgets special occasions or simply gets embarrassed by such ‘commercial nonsense,’ then chances are you’ve been left to plan it all yourself. And that’s just dandy with us. For if there’s one thing we love, it’s getting the chance to go OTT on our dining table for a special occasion. That means beautiful table napkins, an eye-catching table runner, stunning centre piece and gorgeous long-stemmed wine glasses. Candles, petals, chocolates – yep, they’ll all be there too. This white lantern filled with thick, cream altar candles and red petals looks gorgeous on this shabby chic style Valentine’s dinner table. We also love the co-ordinating red wine glasses and colourful crockery. The thick linen table cloth is the perfect crisp, white base for it all. Red is definitely the dominant accent colour in this table setting. Not only is the wine Rose, but a couple of red leather poetry books have been included in the centrepiece too (which is a great idea – who doesn’t want to hear a romantic sonnet or two after sharing a bottle of wine with their loved one?!). The tall, slim white and twisted tapered candles in the glass holders add a further touch of elegant romance. Lovely! If you and your other half are still at the dating stage and both a bit unsure about how ‘serious’ you feel about your relationship, then you could always put his or her mind at ease by presenting them with a personalised Valentine monogram napkin at the dinner table. Having elegant matching napkins displaying both your initials is a pretty permanent statement we’d say… as well as a lovely thoughtful touch. There’s definitely something under-stated and Scandi-style about this Valentine’s table layout. For starters, there’s no ‘in-your-face raunchy red’ but rather a discreet, warm pink to greet the couple. It’s a shade which beautifully matches the natural wooden tree twigs and candles. And look at that lovely little wooden heart sitting on top of the napkin, tied to the plate with a piece of string. Finally, there’s the simple – but effective - message from the Scrabble letters. We love! Just like the monogrammed napkins, you can create a similar romantic effect with an elegant 100 per cent flax linen table runner – exactly like the one above, in fact! Your initials can be sewn into this beautiful ‘Fleur de Lis’ pattern. The rest is up to you but we’d advise either an OTT Baroque or a simple and elegant style table layout to match. 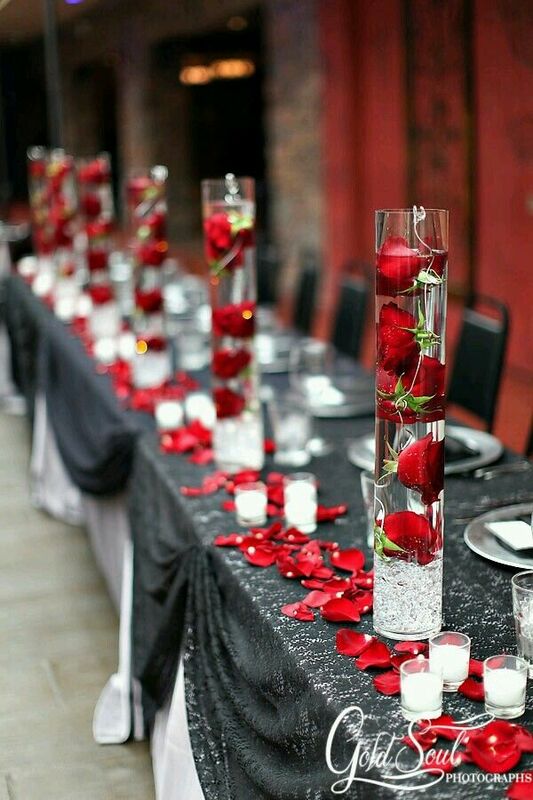 And finally, this Valentine’s banqueting table looks magnificent with these unusual red rose decorations where the buds have been placed on top of each other in long tall glasses filled with ice and water. The scattering of red petals along the dark grey lace table cloth with the thick white linen version underneath definitely adds a bit of a gypsy feel. So how will you be decorating your Valentine’s dinner table this year? For more inspiration on linen table cloths, monogrammed runners and crisp linen napkins, see our website at LinenandLetters.com. Happy Valentine’s!